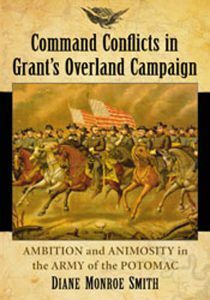 “In this hard-hitting and controversial book, historian Diane Monroe Smith has presented a solid assessment of command conflicts during the Overland Campaign. 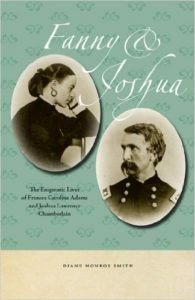 By focusing on the intriguing personalities of the main characters in the Army of the Potomac, Smith brings Grant’s command style into sharp focus. There are excellent and enlightening evaluations of James H. Wilson, John Rawlings, Philip H. Sheridan, Charles Dana, and other members of Grant’s inner circle; and at times the interplay of schemes and sub-plots seems almost to mirror a modern soap opera. There is a tendency to forget how very human historical icons were, and how much even towering figures like Grant could be mired in petty jealousies and controversies. The strongest part of this book is in the latter chapters, which focus much more closely on the themes outlined in the title. The author has given us a finely-drawn picture of the ways in which a group of ambitious men can not only change important events, but how those events are remembered – particularly when they work directly for a man who was not at all averse to tinkering with the historical record himself. Diane Monroe Smith is to be commended for offering us this valuable insight.